Sew Festive Handmade: WIP Wednesday! This is the story of how sometimes things don't need to be perfect. You see, more than a year ago I bought a cute Halloween panel of Riley Blake fabric. I had grand plans, as we all do. I'd cute the scenes up and make wonky log cabins, etc etc. Unsurprisingly, I didn't get there last Halloween. I was determined to have a Halloween pillow this year though. And I had a new 24" pillow form laying all naked on my couch. But I just had zero ideas. None. I now know from buying two panels that have sat unused, that I'm just not a panel gal. So I sewed some of the scenes back together, slightly wonky, with some polka dot sashing. 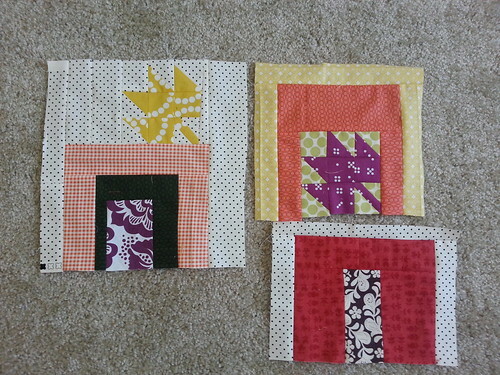 Very very veeerryy simple quilting to frame each square. And then I hit the binding stage and I said ew. I hate binding. I hate making it and doing it. 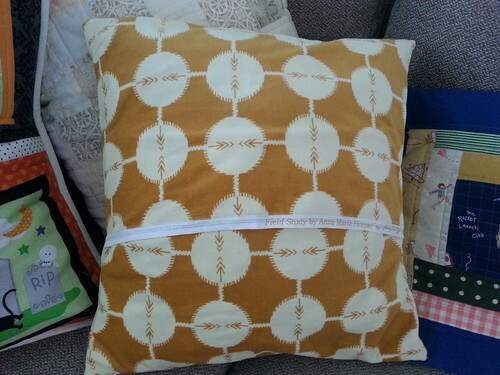 So I knew that if I had to make binding out of that polka dot fabric like I planned, I'd never finish this pillow. So I used a Kona cream color that was leftover binding from something else. And I made an envelope back because I just didn't want to fiddle with a zipper. Can I sound like any more of a lazy sewer than I was with this project? So, moral of the story. This may not have all been the perfect use of this panel, or the perfect pillow cover, but I think it's adorable, it's actually on my couch, and not a single person who comes over is going to wonder why it's not more intricate than it is. In the same spirit, I took some leftover AMH Field Study velveteen that I had and made a 16" pillow cover. It's simple, but it does the trick. And I love it too. I love the feeling and the color with my couch. I love that it will be on my couch all season to bring a little festivity. Oh, and that selvage on the back...perfect! And isn't that the beauty of being able to make these things ourselves? That we can just make something else up if we decide we need a change? Yes, yes it is. This is already too big to be a pillow, so I guess it will be a quilt. Ha. I've decided I will just make up the other 6 leaf blocks without paying attention to size, just overall shape [I want a mixture of tall and wide] and then go back and make 3/4 log cabins without any leaves. Just from making these 3 up I can tell you that this is pretty difficult for me. I like order, and not having a particular size or shape to go for is a little disconcerting. And I'm going to need to balance my color over the course of the blocks, so that the saturation is evenly spread out. The Halloween pillow is darling! Sometimes, "lazy" is the way to go. 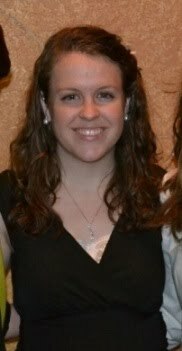 :) Loving your maples too, I also tried to make mine somewhat different, but I went more traditional. The 3/4 log cabin idea is fun, plus log cabins and maples go together, right?! Hehe your post made me chuckle! I have to say - I'm even lazier when it comes to cushion covers - I don't even bother with binding! I'm impressed you went that extra step! 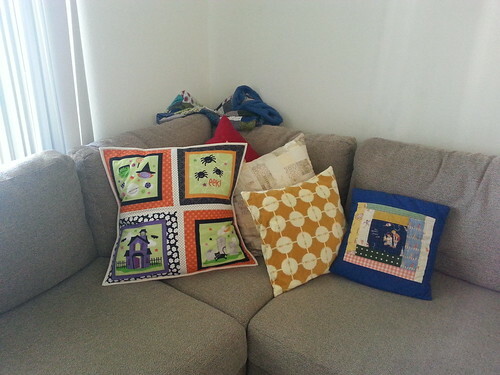 The cushion covers look fab! You cracked me up over your Ewe of making binding. What you did do looks fantastic. 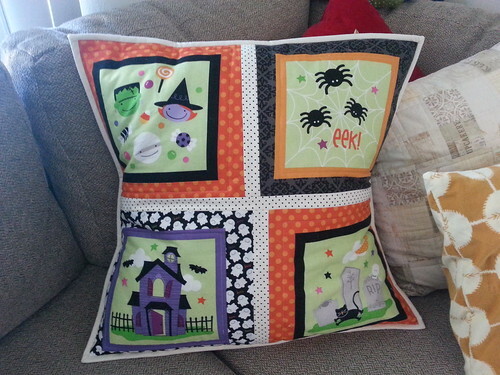 Your Halloween pillow with the wonky frames is so adorable. Great Modern Maples too!